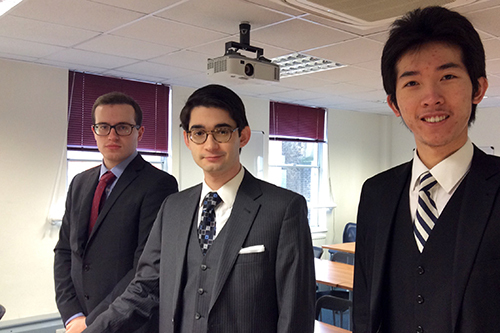 Sixteen students proceed to Round Two for one of the world’s most prestigious and valuable moots. Sixteen students from The City Law School will be proceeding to Round Two of the Senior Moot 2015. Hearings in Round One of the competition took place during the week commencing 19th January. The students are: Matt Henderson, Martin Horne, Chloe Bell, Mark Galtrey, Sophia Stapleton, Jonathan Metzer, James Garnier, Iwona Boesche, Edward Blakeney, Thomas Jones, Richard Wayman, Samuel Parsons, Zachary Kell, Michael Levenstein, Katherine Geddes and Guy Olliff-Cooper. The spectator winning the celebratory bottle of champagne was Jessica Gray, the prize being randomly allocated from amongst the visitors. Round One consisted of 16 moots, each judged by a tutor on the Bar Professional Training Course. The Senior Moot 2015 was declared open last year to approximately 800 postgraduates on the School's BPTC, GDL, LPC and GE LLB professional programmes. The overall prize pot now stands at £3,000 to be divided between Finalists, with the first prize winner being awarded £1,650. 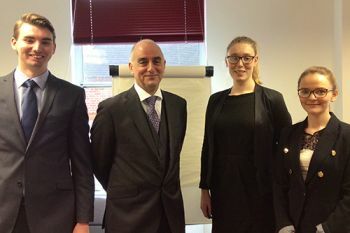 The Senior Moot culminates in the Finals on 7th May at the London West End headquarters of Savills. The distinguished Finals Judges will be Professor Jeremy Horder of the London School of Economics and The City Law School's Professor Peter Hungerford-Welch. 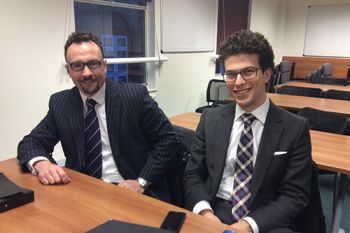 "The City Law School is pleased to confirm the names of those proceeding to Round Two of the Senior Moot later in the year. The sixteen semi-finalists are headed into a tough battle to survive into the Finals in May. We shall again welcome visitors to view the heats and a further announcement will follow with the details. The winner of the celebratory champagne was Jessica Gray, the prize being randomly allocated from amongst the visitors. To all of those, who, despite valiant attempts, were beaten in Round One, we extend our sympathies and hope that the experience was valuable and consequentially spurred you to better levels of advocacy. Thank you to all the Senior Moot participants and followers for their support and interest".